We have started the 5th round of the Open and the 3rd round of the matches. 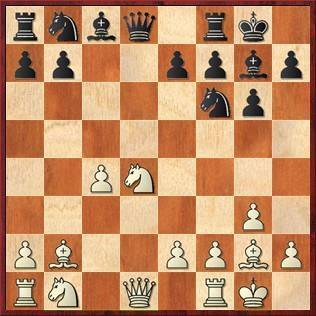 Both match games started with the same first two moves as in the first games, but in both White deviated on move 3. 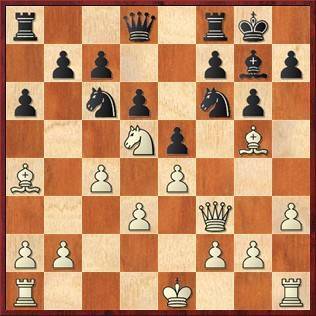 Sam Shankland played 3.Nf3 followed by the king's bishop's fianchetto against Peter Svidler's 2...g6, and Vladimir Fedoseev met Jorden van Foreest's 2...e6 with 3.Nf3 instead of 3.Nc3. So, we can expect two whole different ball games today! Fedoseev's choice for the quiet line of today, with an early exchange of queens, was called clever by the man in charge of the commentary today, Hans Böhm, who sends happy chess greetings to chess fans all over the world! 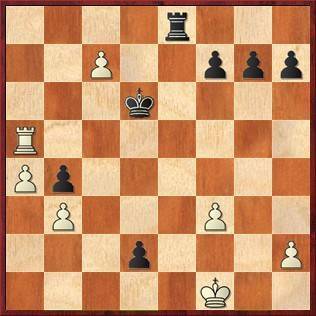 The position after 14...Re8 was still known from a quick draw by Karjakin and Anand from the Tata Steel tournament of this year. 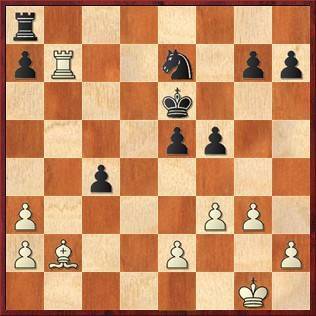 Karjakin played 15.Bc3 immediately, Fedoseev first limited Black's c8-bishop with 15.f3. The (non-)development of this bishop is Black's main problem in this line. 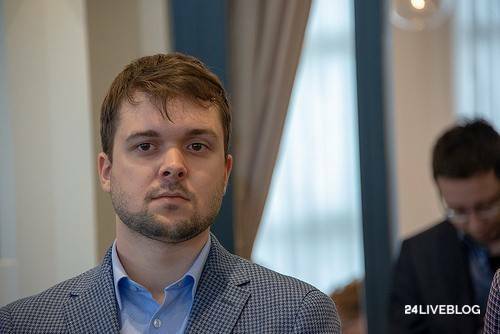 Peter Svidler has responded dynamically to Sam Shankland's double fianchetto. He has opened the centre and offered a pawn with the active 10...Nc6, which White'd better not take... not immediately, of course, but after 11.Nd2 Bg4 White did take the pawn, and commentator Hans Böhm doubted if Black now has sufficient compensation. Irishman Henry Li was in for an early shock today. Black has mistakenly taken on f3, which turns out to be a grave error. 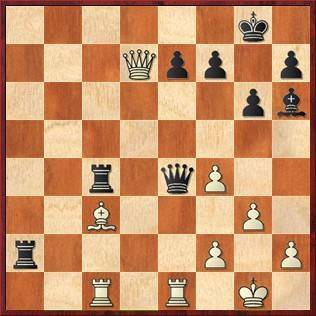 Here he must have counted on the move 11...Nd4 but was in for a shock: Van Randtwijk replied with the lethal 12.Qxf6! and White wins a piece in view of 12...Bxf6 13.Bxf6, threatening 14.Ne7+. Yes, the move may have the idea to limit Black's c8-bishop. But now with Black's knight still on a5, Van Foreest played 15...f5! 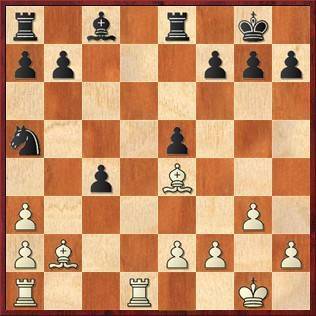 16.Bd5+ Be6 and Black keeps his pawn. White gets a rook on the seventh rank for it, but is this really better than the plan with 15.Bc3 Nc6 16.Rab1, with nice control for White? Rakshitta Ravi has ambitiously castled queenside on move 15, which was an invitation for Valentin Buckels to play 15...d4 and demolish White's queenside. This looks disastrous for the 13-year-old Indian girl, but she has saved herself from bad positions before. Will she make it this time? The fight on the top board of the Open, Amin-Guseinov, is quite interesting. White has the structure, Black the activity. It looks like a dynamic balance. Dmitry Kryakvin is mounting the pressure on Stefan Kuipers, who is having a hard time. His teammate Merijn van Delft seems to be holding up better against Evgeny Romanov. His kingside looks slightly loose, but the same goes for White's queenside. Their teammate Roeland Pruijssers is equalish against Erik van den Doel, but is now starting something on the kingside. The first full point of the day was scored by Roel Hamblok. The Belgian FM got very fluent play on the black side of a McCucheon French and never looked back, finishing off with a relentless king hunt against Jip Damen. In fact Peter Svidler did have sufficient compensation for the sacrificed pawn, as he proved with a simple liquidation on moves 17 and 18 (...Bh6 and ...Ne4). 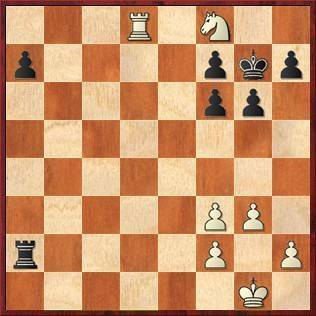 White's a- and c-pawns were doomed, and now a position is reached where neither side seems to be able to undertake much. We'll see if these top GMs can surprise us after all. The first undecided game in this match - more soon! 'This move was played by Anish (Giri, against Kramnik in Stavanger 2016, PB), so it should be good', said Svidler. This direct method had been underestimated by the American GM. 'A devilish trick', Shankland grinned. Not 23...Rxc3? 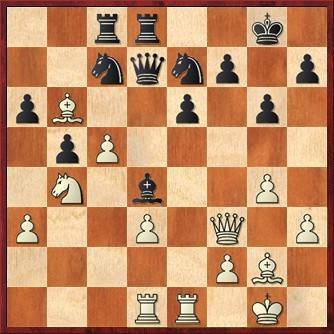 24.Qc8+ and White wins! But now the fire goes out. everything and you don't have to work it all out over the board.' 'Anyway the level of the three games has been pretty good so far', Shankland ventured. 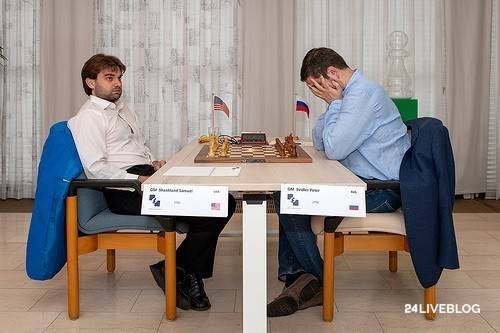 'Yes', Svidler agreed. 'In the first game, Sam played much better, in the second I played slightly better...' 'Much better', Shankland interrupted. 'Of course if both sides play good all games should end in a draw, but still it was OK.' And off they went to grab a bite to eat together. Stefan Kuipers has resigned in a prospectless position. 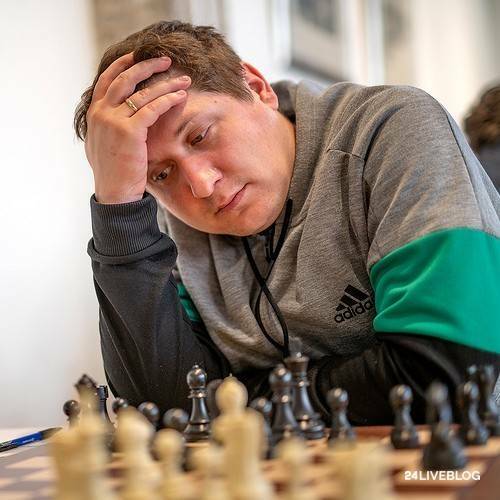 After Dmitry Kryakvin's last move, 36.Rf6, all kinds of bishop sacrifices are in the air, and the Dutch IM decided not to wait which one the Russian was going to choose. On first board structure seems to be winning from activity. 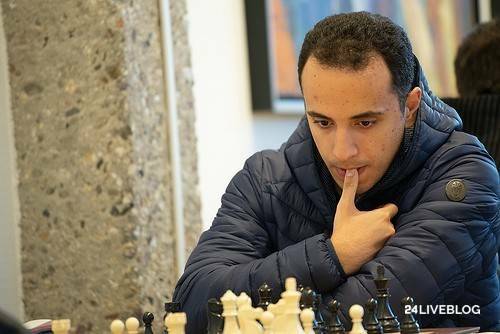 Bassem Amin has gained a pawn with some intricate manoeuvres, and it doesn't seem as if Gadir Guseinov can create anything here. Eltaj Safarli, no. 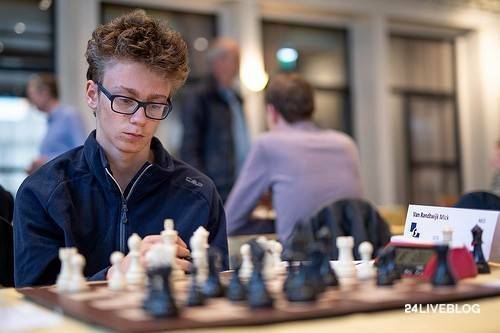 2 by Elo rating in the Open, beat Marijn den Hartog. The Azeri GM was always slightly better, and the attempt at liberation by the young Dutch player with 17...d5 and 18...Ne4 backfired badly. 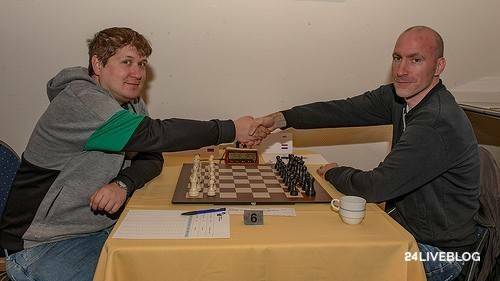 The encounter between the two highest-placed Dutch players, GM Roeland Pruijssers and GM Erik van den Doel, has just ended in a draw after a fairly uneventful game. The third Apeldoorn player on the top boards, Merijn van Delft, is also cracking in time pressure. In this position the Dutch IM tried to lift the pressure with 34...Ned5? but this led to material loss. After 35.c6 Qe8 (unfortunately 35...Qd6 also loses a piece after 36.Bxd4 Nxb4 (this counter-capture doesn't save Black here) 37.Be5) 36.Nxd5 Rxd5 37.Bxc7 cannot take back because the rook on d5 is hanging due to the pin along the e-file. Merijn had to play 37...Qxc6 but this is losing. 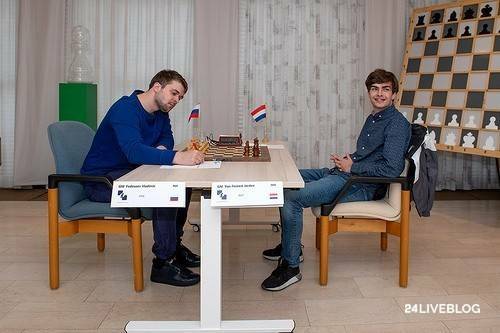 For the third time, Vladimir Fedoseev tested the endgame technique of Jorden van Foreest for hours, and again the Groningen GM didn't budge. A third fighting draw against a world top player. The discussion was about White's 15th move. 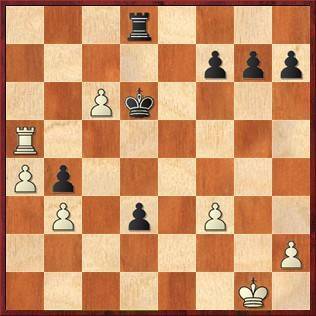 Here Karjakin had played 15.Bc3 against Anand in Wijk aan Zee, after which White has some pressure after 15...Nc6 16.Rab1. Van Foreest knew this, but Fedoseev didn't, although he was the one who had opted for this variation. 'But anyway, after the line in the game White still had pressure.' 'Yes, it was quite unpleasant for Black', Van Foreest admitted. According to the players White missed a chance on move 23. 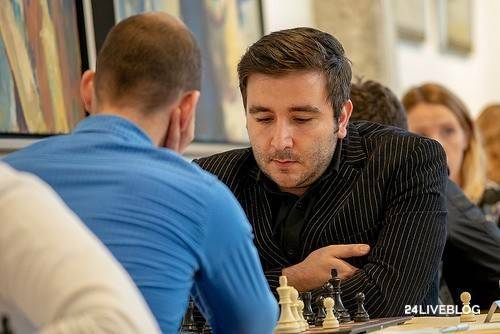 'Here, instead of 23.Rb5 I should have played 23.Kf2, when I should have some edge', Fedoseev thought. Stockfish gives 23...Rc8 24.Bc1 c3 25.Rxa7 c2 26.Rb7 Nd5 27.Ke1 Nc3 as an equalizer here. Anyway, the balance was never disturbed in the rest of the game. Two more interesting draws were seen in the matches today, and with the rest day coming both matches are still very balanced. In the Open, Bassem Amin took over by beating the leader, Gadir Guseinov, with very careful and technically strong play. Dmitry Kryakvin pushed Stefan Kuipers to the edge and joined the lead on 4½ points. Evgeny Romanov, Eltaj Safarli, P Karthikeyan and Guseinov are trailing by half a point.